Seán Brady says the ruling in the X Case was “flawed” and a referendum is needed to reverse it, but Pat Rabbitte disagrees. Cardinal Sean Brady is "appealing for a calm, reasoned discussion" on the "very important issue" of abortion. THE CATHOLIC PRIMATE of all Ireland, Cardinal Seán Brady, has said the Supreme Court’s ruling in the 1992 ‘X Case’ is “flawed” and that a referendum should be held giving the public the opportunity to overturn it. Speaking on RTÉ radio this afternoon, Cardinal Brady said the “only remedy” to the ruling in the case “would be another referendum”. The X Case saw the Supreme Court rule that the Irish constitution permits abortions in circumstances where the life of the mother is at risk, including through the risk of suicide. So far, however, no government has legislated to give effect to this finding. Health minister James Reilly has formed an expert group to report on the European Court of Human Rights’ ruling on A, B and C versus Ireland, which criticised Ireland for failing to give effect to the Supreme Court’s ruling 20 years ago. Brady told RTÉ Radio 1′s This Week programme that if the expert group recommended legislating for abortion under limited circumstances, the Church would respond with a vigorous campaign. “We would have a media campaign, we would by lobbying public representatives, and hope to write a pastoral letter on the situation,” the Cardinal said, saying the Church would also provide “resources to priests to breach on this topic in the pulpit”. Brady added that he was “appealing for a calm, reasoned discussion of this very important issue”, but insisted that the Church’s attitude to abortion did not mean women had to carry a pregnancy even if it meant threatening their own life. Speaking after Brady, communications minister Pat Rabbitte said he did not see “any necessity” for any measure which could result in “undoing what has been done to date”. It would be a retrogressive step if we were to go back to the days of the Catholic Church dictating to elected public representatives how it should address an issue that every large section of our society believes that governments in the past already have done. He agreed with Brady, however, that it was important to avoid any “bitterness and divisiveness” in approaching the issue of abortion. 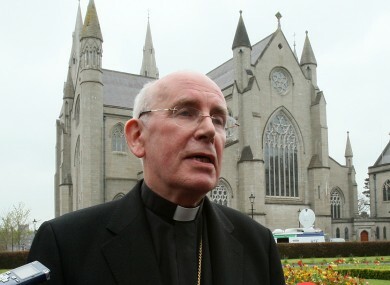 Separately, Brady affirmed the Church’s opposition to legislate for gay marriage, saying a union between a man and woman was “the most favourable position in which children can be reared”. “We feel that to call it ‘gay marriage’ is, in fact, to weaken the traditional notion of marriage which is so important to society,” Brady suggested. Email “Cardinal appeals for abortion referendum – but minister sees no need”. Feedback on “Cardinal appeals for abortion referendum – but minister sees no need”.